Celebrate Diversity – Sue Shipe, Ph.D.
Here’s what people are saying about it!……. What a great resource guide for educators, coordinators, and organizers with an interest in diversity. The Bill of Rights is an especially effective tool to have on hand at meetings and events that celebrate diversity. Celebrate Diversity! 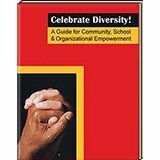 A Guide for Community, School & Organizational Empowerment is a helpful resource of thoughts, advice, suggestions, and practical ideas for promoting tolerance, acceptance, and celebration of differences in one’s school or organization. Pages are filled with inspiring verses, tested strategies, soul-searching questions, and other thought-provoking inducements to break out of closed-minded habits. For example, a list of sixteen suggested activities for “International Unity Day” includes “Have an Old Timers Day for the community. Encourage storytelling, dancing, old records, and other items of personal history to be shared with old and young” and “Have a writing contest on the topic of Peace and Unity. Allow the winners to read their winning compositions on local television. Or have a statewide congress of students and adults talking together on the topics of Peace and Unity.” (Author Sue Kidd Shipe, Ph.D. encourages the annual community commemoration of September 11 as “International Unity Day”, as an antidote to divisive hate- and fear-mongering over the tragic September 11 attacks.) Highly recommended. life and business coach, and author from India.